There it was, corralled behind a thin rope inside a grassy expanse at Redwood Acres: the retired figure-conscious logger's dreambike. No, nothing noisy or fume-spewing, chrome-boasting or rubber-laying - those kinds of bikes are for sissies. 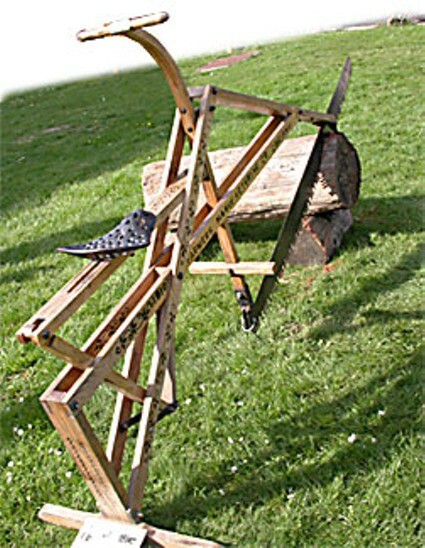 This was a deceptively delicate, spindly blond wood affair, stationary, with the playful look of an old Flexible Flyer© snow sled crossed with some serious functionality in the shape of a long saw blade attached to the front fork. A pretty floral pattern was woodburned onto its frame. 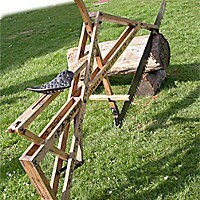 According to the plaque in front of it, this was, actually, a "Giant Sit Down Saw." 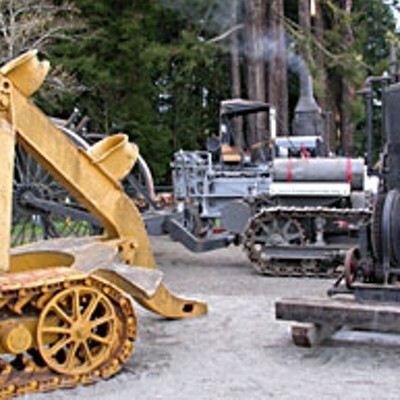 A one-man giant sit-down saw at that, built in 1910 by Farmers Manufacturing Co. in Cincinnati, Ohio, and brought to the 69th Annual Redwood Region Logging Conference last week by someone named Rasmason from Santa Rosa. Several people hovered under an awning behind the saw, watching passersby as they stopped, gawked, puzzled and leaned forward yearningly before wandering off. "C'mon, try it," said one man to a lingerer. She shook her head, for some reason, and said, "No, you try it." So he walked over, swung a leg up and sat down on the metal tractor seat, put his feet on the wooden crossbar and started sawing through an old log. "It's the world's first exercise bike," he joked. "And, this way, you get something useful out of it when you're done: firewood." The woman thought briefly of her grandpa, who one day when the Coors Classic international bicycle race, including then up-and-comer Greg LeMond, happened to be spinning past her house, had glanced out the front window and grumbled, "Hell, a monkey can ride a bicycle!" Her grandpa believed in hard labor as the only honest form of exercise. Bicycles were great for kids. But adults? If your exercise didn't produce something - firewood, a house, a garden - then you were just wasting your breath. So, OK, perhaps the sit-down saw was all function back in its day - who had time or need to "get in shape" when work and more work could whittle a body to hungry leanness? 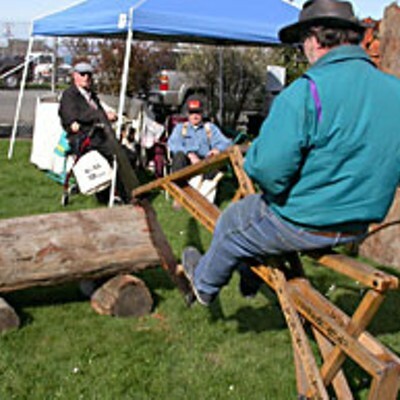 But this is the way a non-logger might approach such a thing as the annual logging conference - looking for applications beyond the obvious, and seeing whimsy everywhere. Why, the whimsy started back in the Acres' parking lot. Just try and find a spot to tuck in a "small" pickup amid the fresh-scrubbed enormousaurs standing flank to flank like so many giants' steeds: the Kodiak 4500s, the MegaCabs, the Denalis, the F10,000s. It wasn't a stretch to wonder why trucks get bigger as gas prices rise. Inside the fairgrounds, the theme continued: here a house-sized Link-Belt something-mover, there a HITACHI pick-you-and-your-town up, and here a veritable grove of handsome tires (if you like tires). It was like being a kid, magically shrunk to ant size, wandering among towering Tonka trucks down in the dirt below the back deck. But yes, logging's serious business. 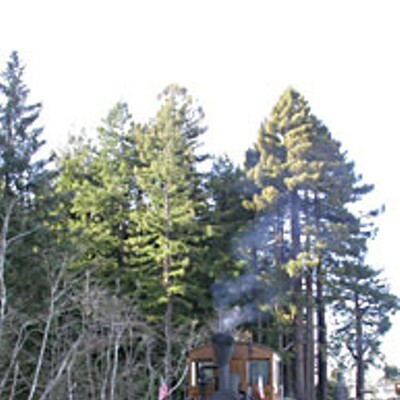 Builds houses, makes paper, provides jobs - forestry and logging account for 12 percent of Humboldt County's economy, dontchaknow -- not to mention riles up people when certain timber companies get out of whack with what's considered socially, economically and environmentally responsible behavior. 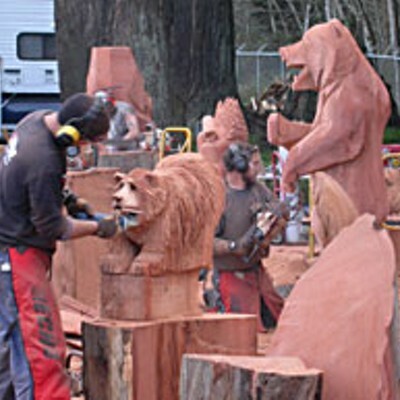 And, yes, there were beefy humans flinging axes, leaping over logs, speedsawing and greenchaining their way to trophies. The air, reverberating with the whine and roar of machinery, smelled like oil, gasoline, sawdust and sugary cafe grease. But there also were poodles sitting with their people behind vendor booths. There were big, comfy leather recliner chairs for sale - well, that's just practical, something to rest the weary bones in. And down on a dirt stretch, below the broad platform where the humongous forestry machines posed and flexed, was a hive of warm and fuzzy activity to soften even the most jutting-jawed hardheart: the wood-carving contest. Big, burly men, wielding spinning round blades and roaring chainsaws with the grace of baton twirlers, buzzed and buffed the muzzles of emerging creatures, mostly bears, coaxing expressions onto their wooden faces with a little nip of the blade, a scorch of the flare-torch - curiosity for this bear, fierceness for that one, hug-me-I'm-yours for the one over there. Later, these cute wood critters would be auctioned off to raise money to educate kids about forestry. And after that, the loggers and their spouses, the vendors and their poodles, would gather in the ballroom for the highlight of the conference: a dance competition! Yes, that's right - and dance instructor Bruce Hart would be putting the competitors through their paces before the show. Sigh. Another year, another conference. Soon, they'd be packing up their huge toys and practical machinery, and rolling on out to whatever comes next. Work, most likely, for most folks - whether in logging or some newfangled endeavor. Maybe easy chairs and exercise bikes for others.